By Lauryn on August 27th, 2013 . Filed under: Blogs, Recipes . During the summer’s hottest and most humid days, there are times when you want a cooler alternative to cakey cupcakes with thick and sugary icing. 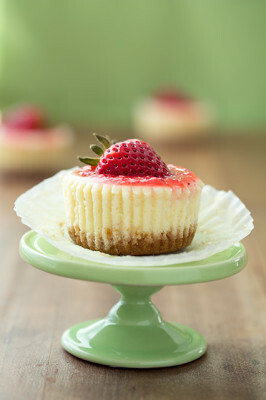 Those muggy days are where cheesecake cupcakes can be the perfect substitute. Their density isn’t overly sweet and they’re usually at their tastiest when served chilled. While cheesecake cupcakes work with or without toppings, the fresh fruit of summer is often the perfect finishing touch. So here are recipes for several cheesecake cupcakes to try. This first recipe is one I remember my mother making when I was little so it’s one of my favorites. In many cases, the toughest part of a cheesecake cupcake is the crust. These little cheesecakes are built on a Nilla wafer cookies. A little dab of cherry pie filling on top finishes them off. With only six ingredients, they’re ridiculously easy to make and are perfect for beginners. But if you want a more complex and layered flavor cheesecake, the recipes from Cooking Classy are a little more advanced and recipes for the strawberry and caramel toppings are included. As anyone who has ever visited one of Cheesecake Factory’s locations knows, there’s are a lot of flavor combinations out there for cheesecake. More and more of experimental combinations are creeping up online and because of the basic ingredients used in cheesecake, they adapt well for those who require gluten free diets. Food Network has a gluten free twist on a classic New York style cheesecake cupcake. 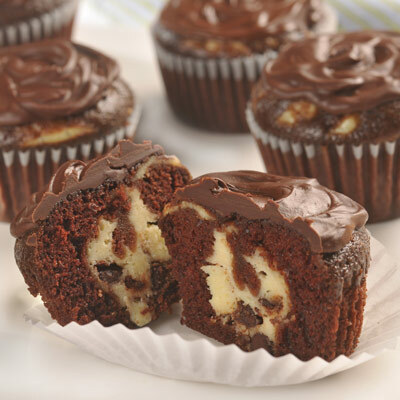 For more cheesecake cupcakes with a chocolate twist Nestle has a recipe for chocolate cupcakes with a cheesecake center while Cooking Classy has started developing cheesecake cupcake variations of her own including an enticing Nutella cheesecake cupcake.